Michelin Primacy MXM4 tires are all-season grand touring tires that are built specifically for all-weather handling. They are designed to not only provide a comfortable ride, but also give you the highest level of traction in dry, wet, and snowy conditions. Most of these tires meet the necessary requirements to be considered one of Michelin’s Green X Standard tires for low rolling resistance, giving the vehicle better fuel consumption and fewer emissions of CO2 gasses. Michelin uses their patented sunflower oil-enriched Helio Compound technology in this tire to increase traction at lower temperatures. This helps to provide better handling and braking in wet conditions and overall better performance in the snow. The asymmetric tread design and European handling profile help to provide the driver with more predictable cornering as well. Another nice feature is the Comfort Control technology with precision manufacturing methods to help reduce the vibration and road noise from the road. Michelin also designed this tire with BAZ technology to give it the stability and durability necessary for longer use at higher speeds. Overall, the Primacy MXM4 tire has excellent performance features in both wet or dry road conditions, as well as a ride comfort you would expect from a tire like this. 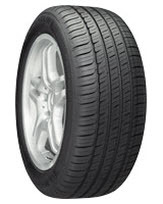 Add in the 55,000 mile tread warranty and this tire is a solid choice for any coupe or sedan owner. Prices on the Michelin Primacy MXM4 start at around $130 and range upwards to approximately $250 for the 19 inch series models. Get the best Michelin tire offer with coupon below, or find other tires discounts. Who Are Michelin Primacy MXM4 Tires Designed For? Michelin has designed the MXM4 for luxury sedan or sport coupe owners who seek a tire that offers excellent handling and performance on both wet or dry surfaces, as well as superior riding comfort and minimal road noise. Michelin Tires backs the Primacy MXM4 with a 6 year or 55,000 mile warranty for the H, and V rated tires, and a 6 year or 45,000 mile warranty for the W, Y, and Z rated tires. They are also covered by a 1 year or first 2/32 inch of wear uniformity warranty. Materials and workmanship are covered for 5 years and include free replacement within the first year or first 25% of wear. The tire is then prorated out until the final 2/32 inch of useable tread depth. Finally, Michelin also provides a 3 year flat changing warranty and a 30 day customer satisfaction guarantee.